You are currently browsing articles tagged trug. MERL 70/223 and 70/224. 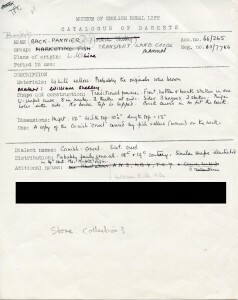 Two of the four ‘Southport boat’ baskets included in Stakeholders. Are all in Southport boats made using the same materials and the same construction techniques? 107 baskets have been initially selected for study in the Stakeholders project. 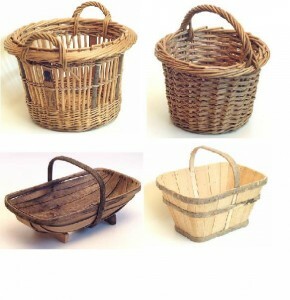 These are baskets that have never been looked at by a basketmaker, or someone with expert knowledge. By and large, they are baskets which do not have one of Dorothy Wright’s ‘Catalogue of baskets’ forms (transcribed and scanned as part of A Sense of Place). With a few exceptions, they were all acquired by MERL after 1970. Whether the basket is of particular interest for some reason – such as having an interesting use or provenance, or an unusual appearance etc. There are still some baskets I’m unsure about. 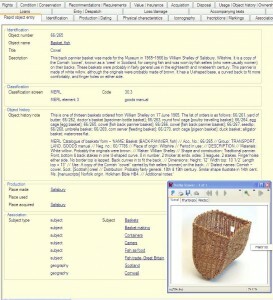 For instance, 4 ‘Southport boat’ baskets are included in Stakeholders but are they all the same? Are they all made in the same way using the same construction/weave? Do we need to look at all of them or will one do? And how do I choose which one? I’m still working on this process – I currently have about 55 in the high priority category (which seems a bit too many), 17 as medium priority, and 44 as low priority.